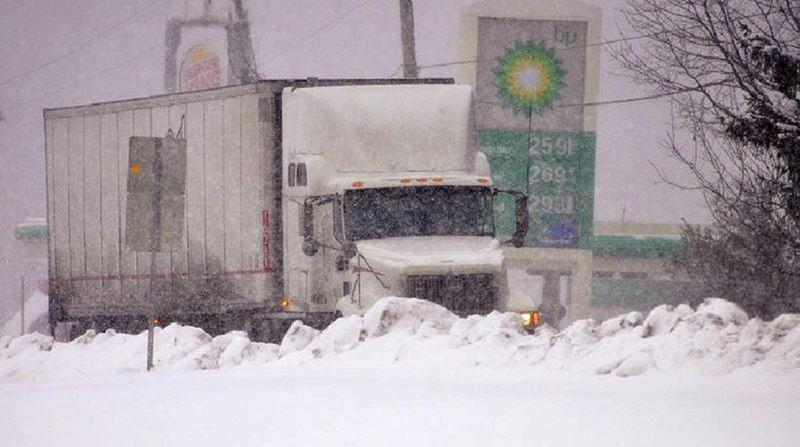 Increasingly sophisticated weather forecasting applications are helping fleets and drivers navigate around adverse weather conditions that could pose safety risks or delay the movement of freight. “As long as there has been weather to observe, there have been significant efforts to try to predict it — all the way back to the days of the Farmer’s Almanac,” said Chad Lindbloom, chief information officer at freight broker C.H. Robinson Worldwide. Rapidly improving technology has put weather forecasting and radar capabilities into the hands of consumers — first through desktop computers and now via mobile apps and more, Lindbloom said. Eden Prairie, Minn.-based C.H. Robinson ranks No. 5 on the Transport Topics Top 50 list of the largest logistics companies in North America. Hurricane Harvey’s devastating sweep into Texas and the Gulf Coast in August, as well as Hurricane Irma, which struck Florida earlier this month, greatly disrupted freight transportation throughout those regions. Weather command center at FedEx headquarters in Memphis, Tenn., via FedEx Corp.
“As more companies implement these new models, profitability will be realized more and more,” Witty said. PeopleNet offers myRoads, an application that alerts drivers when inclement weather could affect safety or delivery time. When the truck is not moving, the myRoads service allows drivers to view a map showing current and forecast weather and road conditions. Then, once in motion, the driver can receive detailed weather warnings from the application via text-to-speech functionality. C.H. Robinson’s Lindbloom, meanwhile, thinks the rise of new weather technology may be the start of an important niche for today’s competitive trucking firms when they must deal with disruptions from weather events. One company is developing a trading platform that will enable shippers, carriers and third-party logistics firms to lock in freight rates ahead of major weather events and other natural disasters, such as earthquakes, or social and infrastructure-related breakdowns. “Weather is one of the biggest disruptors causing market volatility both in the short term and the long term,” said Craig Fuller, CEO of TransFX in Chattanooga, Tenn. The company is planning to launch a trucking futures market next year. “We now have the ability to unlock that same value within transportation,” he said. Other transportation-related companies that are working with Riskpulse and incorporating weather analytics into their business include 10-4 Systems, a supplier of cloud-based technology for monitoring shipments; load matching startup Lanehub.com and Q Products and Services, a Chicago-based company that makes specialized containers and covering materials to protect temperature-sensitive shipments. At a recent conference hosted by Q Products and Services, Jon Davis, a lead member of the meteorology team at Riskpulse, said global warming trends likely will lead to more extreme weather events but also could open up new trade lanes as sea ice melts and seasonal weather patterns change. “Novembers are completely different than they used to be,” Davis noted. Overall, experts said the real-time information that weather applications are providing to fleets and drivers is making a difference. Cookeville, Tenn.-based Averitt ranks No. 31 on the Transport Topics Top 100 list of the largest for-hire carriers in North America. Trucking telematics providers are increasingly incorporating weather reporting and information into their telecommunications systems. Inputs such as weather station data, existing forecasts and other parameters may be computed and transmitted to and from trucks on the road, helping drivers make decisions about their travel itineraries. For example, Telogis’ algorithm prioritizes roads based on a wide range of factors, including avoiding adverse weather and road closures to ensure drivers get the best route, Cave said. PeopleNet’s Witty said weather navigation can provide a quick return on investment. Daniel P. Bearth, senior features writer, contributed to this story.